Brain Points: A Growth Mindset Reward Structure Boosts Player Persistence! Psychologist Carol Dweck has made an interesting discovery. She and her colleagues have found that children’s beliefs about their intelligence can have a strong effect on their motivation and academic achievement . Studies show that children typically hold one of two mindsets: they either believe that their intelligence is an unchangeable attribute (fixed mindset) or they believe that their intelligence can be increased through hard work (growth mindset) [1,2,5]. Children who hold a fixed mindset view challenging situations as “tests” of how much intelligence they have, and view effort and mistakes as indications of low ability, while children who hold a growth mindset view effort as a necessary part of the learning process [1,5]. These mindsets affect students academic achievement. Studies show that children with the growth mindset respond well to challenge, and that their grades improve during the difficult transition to middle school. However, children with the fixed mindset lose interest when they are challenged, and show static or decreasing grades during middle school . The most important finding of Dweck’s research is that children’s mindsets can be changed. Programs that praise children’s effort and teach them that intelligence can grow have been shown to increase grades and make students more resilient in the face of failure [1,4,5]. This discovery has important implications for educational video games. Games have great potential as educational tools because they can provide constant feedback, instruction, and motivational rewards to players . But games often emphasize speed and performance, rather than effort and learning. To show the potential benefit of incorporating the growth mindset into educational games, we performed a study with 15,000 players on BrainPOP’s GameUP. We created two versions of the Center for Game Science’s puzzle game Refraction, a growth mindset version and a control version, and studied how players respond to each type of game. The growth mindset version of Refraction introduced a new “brain points” system that rewards children as they play for hard work, use of strategy, and incremental progress. 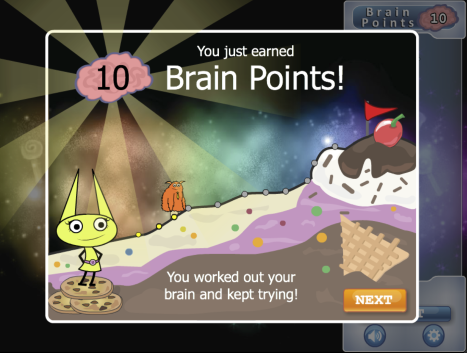 An tutorial animation at the beginning of the game teaches children that intelligence can grow, and summary screens praise students for their effort and strategies and show their progress over time. The control version of Refraction included a “fraction points” system that rewards children for solving level puzzles, a common way that video games measure success. The tutorial animation in the control presents a neutral message about the importance of fractions, and summary screens give an overview of the fractions made in each level. We analyzed children’s behavior in the two versions of Refraction, and found exciting results. Children who played the growth mindset version stayed in the game longer and completed more levels than those who played the control version. They also learned to use the strategies rewarded by the brain points system, and persisted longer after struggling with a particularly challenging level than children who played the control version. These results show the importance of rewarding effort, strategy, and learning rather than performance, and suggest that educational games can improve student persistence by teaching the growth mindset. Learn more about the growth mindset and play the brain points version of Refraction on GameUp! Also, check out the Center for Game Science. An academic paper describing these results in more detail is currently in submission. We will post it as soon as it is published! Good, C., Aronson, J., and Inzlicht, M. Improving adolescents standardized test performance: An intervention to reduce the effects of stereotype threat. Journal of Applied Developmental Psychology 24 (2003), 645–662.